Meenakshi Amman Temple is a historic Hindu temple located in the southern bank of river Vaigai in the temple city of Madurai, Tamil Nadu, India. 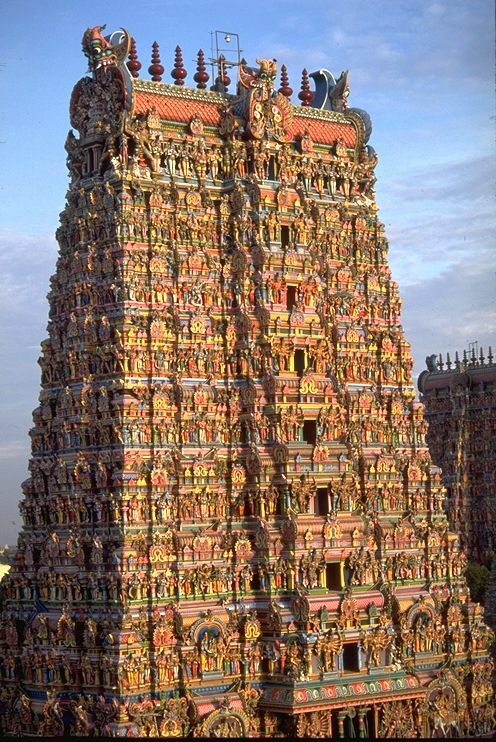 It is dedicated to Parvati who is known as Meenakshi and her consort, Shiva, named here as Sundareswarar. The temple forms the heart and lifeline of the 2500 year old city of Madurai. The complex houses 14 gateway towers called gopurams, ranging from 45-50m in height, the tallest being the southern tower, 51.9 metres (170 ft) high, and two golden sculptured vimana, the shrine over sanctum of the main deities. The temple is a significant symbol for the Tamil people, and has been mentioned since antiquity in Tamil literature, though the present structure is built during 1623 to 1655 CE The temple attracts 15,000 visitors a day, around 25,000 during Fridays and gets an annual revenue of sixty million INR. There is an estimated 33,000 sculptures in the temple and it was in the list of top 30 nominees of the "New Seven Wonders of the World". The annual 10 day Meenakshi Tirukalyanam festival celebrated during April–May attracts 1 million visitors.